Paddy Kenneally (1916–2009) quit his job as a wharfie the day Japan bombed Pearl Harbour in 1941 and enlisted in the Australian Army. One month later, after undergoing minimal training, the tough Irishman was on his way to join an elite guerrilla unit in East Timor. While more than 20,000 Australian soldiers were captured by the Japanese on islands to the north of Australia, the unit in Timor known as the 2/2nd Australian Independent Company fought a successful guerrilla war in the mountains. Kenneally took part in two of the defining actions of this campaign during his year of service there. On the night of 14 May 1942 he was one of 13 men who mounted a raid into the heart of the Japanese headquarters in the capital, Dili. The men shot up the barracks and escaped without suffering any casualties. Kenneally, and his platoon commander Geoff Laidlaw, were the last to come of the town that night. One week later, when the Japanese came looking for the raiders, Kenneally was there again. He was one of six men who ambushed about 100 Japanese soldiers near the village of Remexio, in the hills above Dili. The Australians were armed with 303 rifles and one sub-machine gun, but they used the terrain of Timor to their advantage and took more than 20 enemy casualties. One of those killed in this attack was a senior Japanese officer who had been brought to Timor to drive out the bandits in mountains. All of this would not have been possible without the support of the local population. Kenneally and other veterans said they would not have lasted a week had the Timorese not protected them. The Timorese paid dearly for their support, with an estimated 40–60,000 perishing in the conflict. As Kenneally often said, all they got from supporting us was misery. Kenneally served with the 2/2 for the rest of the war and saw action in New Guinea. He also returned to PNG after the war and at 75 climbed Mt Wilhelm, the country's highest mountain. John Patrick Kenneally, always known as Paddy, who has died aged 93, was born in Youghal, County Cork, Ireland, son of Michael Kenneally and his wife Mary Ellen Morrissey. The family migrated to Australia in 1927. By virtue of his energy and longevity, Paddy Kenneally probably did more than any other person to remind Australia of its debt to the Timorese, especially after the Whitlam Government gave Indonesia the green light to invade the territory in 1975. During the occupation Kenneally visited the territory four times, starting in 1990, when he was 76, and travelled extensively around the hills where he had fought. He returned three more times after the ballot on self determination. Kenneally reported back to East Timor activists in Australia, and to the veterans who remained involved in the country, through aid projects and their newsletter, the 2/2 Commando Courier. While he was a Labor man through and through, Kenneally had little time for Gough Whitlam because of his support for Indonesia's invasion. Opening a photo exhibition on East Timor in Parliament House, Canberra in 1996 in the presence of several Labor luminaries, Kenneally lambasted Whitlam for his treatment of the Timorese. When in 2005 East Timor was struggling to get a fair deal in negotiations over Timor Sea oil, Kenneally rallied his mates to fight one last time for East Timor. The following day, the Australian Government capitulated, offering East Timor a 50 per cent share of the disputed Greater Sunrise field. Right to the end, Kenneally's love for the Timorese and the country where he fought remained fervent. Last year, he returned there with two sons and a grandson, where he attended the ANZAC Day service at the war memorial built by the 2/2 veterans overlooking Dili. Paddy Kenneally is survived by his wife of 57 years, Nora (nee Kelly), their children Gerald, Helen, Michael and Sean, and seven grandchildren. Paul Cleary is a Sydney-based author and journalist. His first book, Shakedown, a history of the Timor Sea oil dispute, was published in 2007 by Allen&Unwin. He is now working on a history of Australia's military involvement in Timor in the Second World War. 'Irish John' was a good friend to me..I knew him well on the waterfront in the 1950's when he was an ALP candidate in the WWF elections against the communist leadership of the unioon. Years later when his communist opponent ws dying it was Irish John who spent time with him in the hospice..a very great man, indeed. Vale Paddy Keneally – An INTREPID Man. “Governments are pretty unreliable, you can’t leave your conscience with them.” P.K. I could line up everyone I’ve ever met, and Paddy Keneally is the only person I’d label ÍNTREPID’. Paddy was a singular man; intrepid, feisty, indomitably principled, and unswervingly loyal to the people of East Timor to whom he felt indebted for saving his life and the lives of his fellow 2/2 and 2/4 Commandos in WWII and to whose struggle for freedom he dedicated his life. Like the Ancient Mariner, Paddy was fated to tell everyone about the sacrifice of Timor’s blood for Australian freedoms that hung around his soul like the albatross. A consummate political skeptic, he possessed the Irish utter distain for incompetent and corrupt authority and would unreservedly and fiercely lambaste successive Australian governments for their unconscionable betrayal of the Timorese and subsequent complicity for the deaths of thousands of Timor innocents. Nevertheless, Paddy was a man of action rather than words. He made many trips to Timor assisting, with the funds raised by the commandos, the Salesian Brothers’ education programmes particularly at the Fatumaca college beyond Baucau. Paddy would travel there on a three- four hour ride from Dili in a bemo- a small bus (van) overloaded with Timorese and their goods and animals bought at the Dili markets. In the searing heat, the bemos were mobile torture chambers ..but undaunted by the burdensome aches of age, the heat, the discomfort, Paddy travelled Timor with a dogged fire in the gut and love. The WWII veterans, like Paddy, like Tom Uren, Alan Luby, Gordon Hart and all the others were the spearhead and conscience of the Australian/Timor solidarity movement. They were also personal embodiments of a lost age that bred true gentlemen with a backbone of justice and commitment to the Australian sense of fair go. It was a great, great privilege to meet and work alongside them. On hearing of his death a friend wrote Very sad, he seemed immortal.” No, not ‘seemed’, Paddy is immortal. Stories like this one are precious. Thanks, Paul Cleary. And congratulations, Dr Vlazna. Your comments are eloquent and touching. Thank you, It is not so much the debt we owe for the help. It is that Paddy, as an Australian, lived up to the ideal on which this nation was founded; A Fair Go! Let us now follow Paddy, strive for a fair go for all, whether in here with us, or out there! There were many servicemen in WW11 who loved the loyal Timorese people, including my father, who was a WAG in the RAAF. He always said that he would like to retire there. Unfortunately politics prevented that, and he went to God at the age of 71 in 1988. If his spirit could choose a place to reside, I am sure that it would be there. What a great man! I have always thought the treatment of East Timor by the Howard government over the oil was iniquitous and wrote letters to various MPs abot it, but it took a man like Paddy to get results! He is a true Australian, what a shame that he had to die before he has been recognised! Good for him anyway..A great article by Paul Cleary. 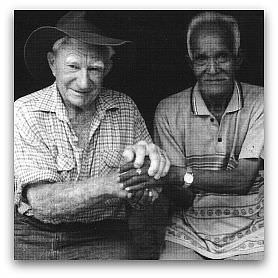 I had the enormous privilege of meeting Paddy in East Timor in 2002. I was serving in the Army at Suai and, one hot, dusty day, we found this little old bloke aged 86 walking briskly down the road in the midday heat. You could have knocked me over with a feather. We took Paddy back to our HQ, gave him a feed and a drink then listened spellbound over the next couple of hours as he told us his stories from the War. His fitness, determination, fervour and enthusiasm were combined with an enormous, genuine regard for the Timorese people and he put us to shame. I treasure the letters he subsequently sent me containing details of his wartime activities. God bless you, Paddy Kenneally: may your soul and the souls of all the faithful departed, through the mercy of God, rest in peace. Amen. A French satirical paper was sued for portraying Muslims as terrorists and labelling them 'jerks'. The editors would have us believe it's a case of free speech versus censorship. But there's more to it than that. Some rules of thumb: always say 'prior to' instead of 'before', 'in excess of' instead of 'more than' and 'in the approximate vicinity of' instead of 'about'. It's good to say things like, 'We'll have to real-time this to impact on the offshore numbers'.